28/10/2014: The sinister niggling feeling in my heart played out folks, this place has shut down. A real tragedy that we won't be able to support the Taiwanese taro-ball maker anymore. Two months ago, a bubble gum-pink sign and fairy lights popped up like an effeminate pinky finger in the midst of truckie- and cabbie-dominated Muteena road. 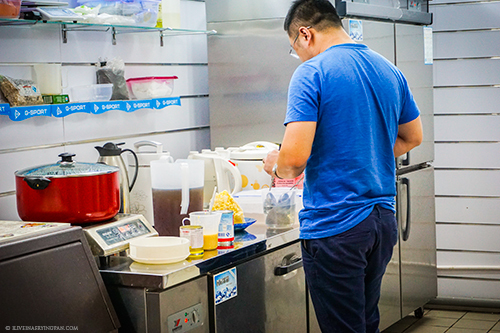 It is a Taiwanese dessert café – eccentric, exotic, and one that is far too large given its non-existent clientele on that road. No one in the area seems to give a damn that it exists, but my heart goes out to this pink underdog that is dishing out shaved ice, taro balls and herbal jellies in a sea of hefty kababs and oily curries. 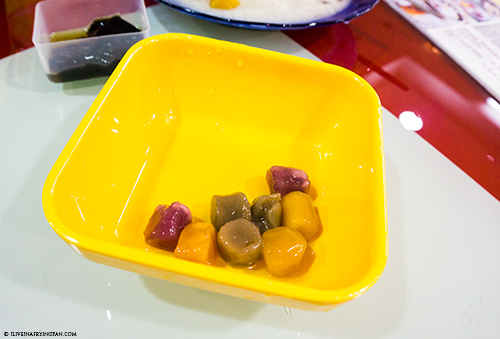 Taro balls are a Taiwanese specialty made out of the starchy roots of the tropical taro or colocasia plant. Alan Davidson (The Oxford Companion to Food) describes it as a 'corm. Cultivated varieties are usually the size of a very large potato, roughly top shaped and circled all over their surface with rough ridges...The skin is brown and hairy. Inside, the flesh maybe white, pink, or purple." The plant itself is native to India and my talented mum deep-fries taro slices with onions and often pairs them with sour tamarind lentils. The dish is so addictive that I usually polish off a quarter of it even before it hits the dining table. 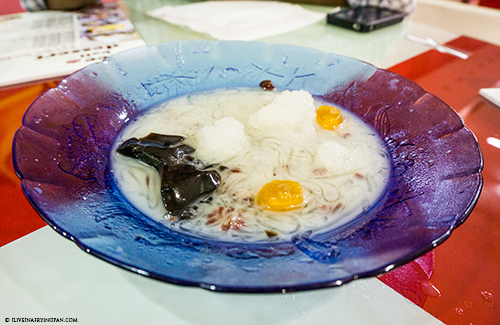 But taro often features in South East Asian desserts as well. 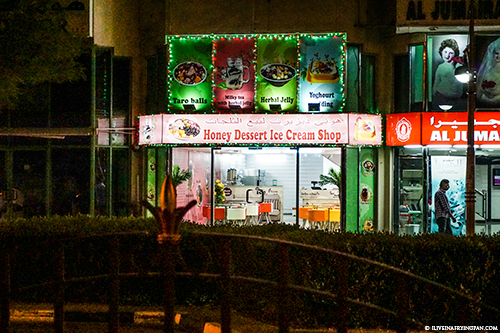 It's just not something that has hit mainstream Dubai, which is why the 'Honey Dessert Ice Cream Shop' is like a no man's land for most of the day A lone customer might walk in, lured in by the promise of ‘Ice Cream’ on the purple signboard. Within two minutes of realizing that the Taiwanese ice cream is as close to ice cream as is a basket of oranges, they’ve probably retreated back to the exit and switched courses to the Baskin Robbins next door. But to that lone ice cream-craving diner, I say stay. I say make the drive out to Muteena and help that bubble gum-pink signboard flicker on. I’m scared that the café’s time is running out and hence, my urgent plea to you to keep something as fun and weird and intriguing alive because who knows, if you wake up tomorrow craving a bowl of taro balls and strings of glassy herbal jelly, this place won’t be around to love you back. 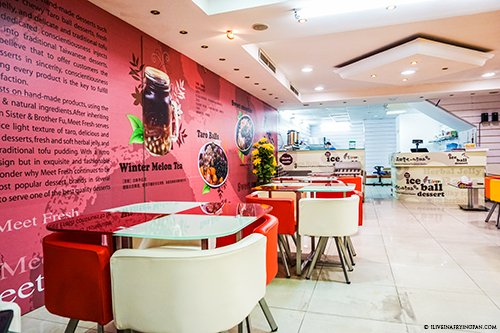 When you step inside, don’t be turned off by the deserted feel of the café. People in Dubai drive miles for cupcakes, taro balls simply haven’t caught on yet. The pink walls will glow back at you with the story of Taiwanese Brother and Sister Fu who handed over their secret recipe to Meet Fresh, an Australian brand dedicated to dishing out the ‘soft and nice light texture of taro, delicious and chewy taro ball desserts, fresh and soft herbal jelly, and delicate and traditional tofu pudding.’ So yes, it’s a bit of a roundabout import – Taiwan to Australia to Dubai. A spectacled Taiwanese man wiggles out from behind the counter in the rare instance that a customer mistakenly walks in looking for ice cream. He has an aura of a mad scientist fused with the tough love of a strict grandma, just as you’d expect from anyone crafting orange, purple and olive-coloured homemade taro balls. If you take the time to learn about him, peek over the counter as he’s preparing your desserts for you, ask him for a recommendation – or as I did, hop with unrestrained joy when he started meticulously concocting my shaved ice dessert – you begin to realize how much passion and detail goes into crafting one of his desserts. It’s not even the taro balls (pictured above) that I’m a fan of, the chewy gummy texture being far less appealing than the shaved ice mound with peanuts, boiled beans, noodle jelly, a substance optimistically named as ‘white immortality,’ and an extra request for condensed milk that I felt would help to draw the disparate ingredients together as one sweet whole. What I love is how different those desserts are to everyday ice cream, cakes or whatever else suits your fancy. There’s an element of intrigue and discovery, and a hat tip to one of Taiwan’s most beloved desserts. Sensing my excitement for the exotic, the Taiwanese host also brought out a sample of a dark herbal jelly, a mildly sweet and floral substance that delicately quivered with intrigue of a healing substance known only to its magical maker. 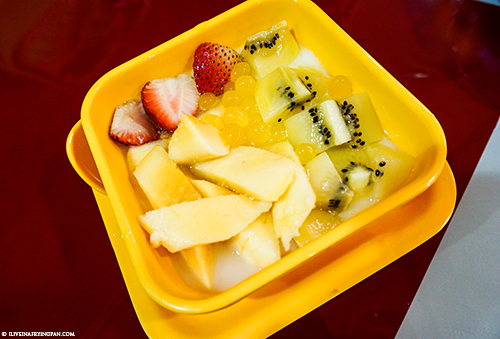 But if herbal jelly sounds a little too exotic, opt for something more familiar like their pleasing ‘yoghourt’ pudding with coconut milk, sweet mango, strawberries, kiwis and curious little slippery globes that burst into a refreshing mango Maaza-like liquid. 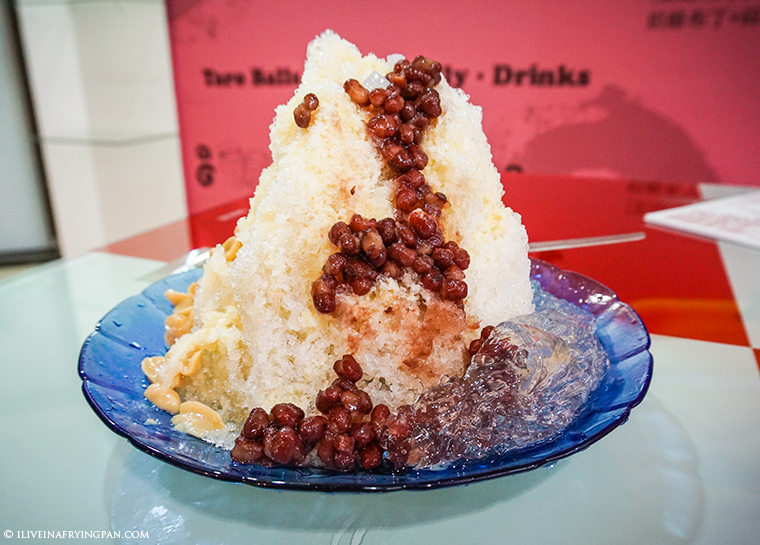 Some of these Taiwanese desserts are definitely an acquired taste, but during a hot humid afternoon or evening, you can’t go wrong with a shaved ice dessert or a cool milky pudding. Especially with temperatures in Dubai still being annoyingly high, I’ll admit that there’s been many a night that I wished this Taiwanese dessert haunt was a few steps closer to home. ← Older: The Freshest Catch: Seasoned, Grilled and Served Up at the Old Deira Fish Market. Ooooh! Very exciting! I consider myself a big shaved ice dessert enthusiast. I’ve sought it out in many countries. I’ve had Hawaiian Shave Ice, Japanese Kakigori, Filipino Halo-Halo, Malaysian Ais kacang and Cendol, and Korean Bingsu. 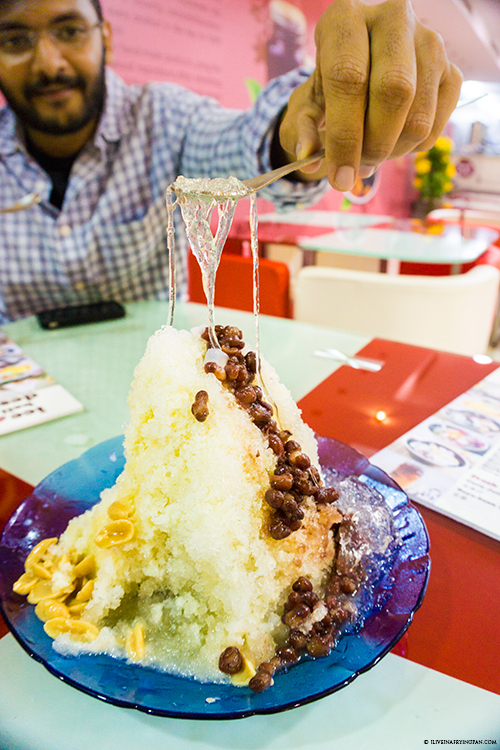 And although I like them all to varying degrees, it was in Taipei last year that I found what I consider the absolute best shaved ice I’ve ever had (particularly at Ice Monster, if you ever find yourself in Taiwan). I definitely want to visit Honey Dessert Ice Cream Shop, and soon, but could you possibly provide any additional location information? Hot Pot is a particularly popular dish in Taiwan so I’m thinking that some shaved ice would be perfect after my next trip to Xiao Wei Yang or Chongqing Liuyishou. Hi, do you have the contact info of the Fu’s? I went there today and it seems like it’s shut down for weeks. I (and our Taiwanese community here in UAE) would like to offer some help if they are still here and would like to continue thier business. Thank you. I knew this would happen. :( I don’t even have a number Gretta. I wish I’d gotten around to posting it earlier before the place shut, so that we could have had a better chance of more people tracking down the owners. Same here, food like this need to be made and served within hours to keep it’s flavor and freshness. Which means they need a big enough customer base to keep the business running. Please do keep us posted if you happen to see them again though.